The robes of Buddhist monks and nuns are part of a tradition going back 25 centuries to the time of the historical Buddha. The first monks wore robes patched together from rags, as did many mendicant holy men in India at the time. As the wandering community of disciples grew, the Buddha found that some rules about robes were necessary. These are recorded in the Vinaya-pitaka of the Pali Canon or Tripitaka. The Buddha taught the first monks and nuns to make their robes of "pure" cloth, which meant cloth that no one wanted. Types of pure cloth included cloth that had been chewed by rats or oxen, scorched by fire, soiled by childbirth or menstrual blood, or used as a shroud to wrap the dead before cremation. Monks would scavenge cloth from rubbish heaps and cremation grounds. Any part of the cloth that was unusable was trimmed away, and the cloth was washed. It was dyed by being boiled with vegetable matter -- tubers, bark, flowers, leaves -- and spices such as turmeric or saffron, which gave the cloth a yellow-orange color. This is the origin of the term "saffron robe." 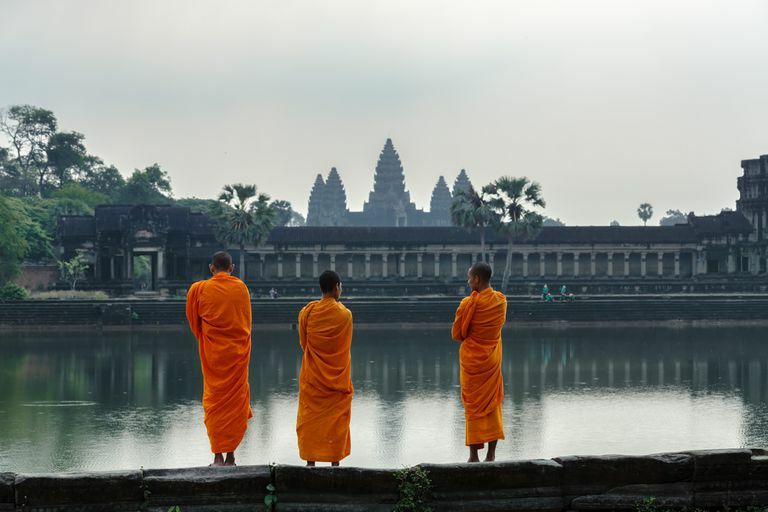 Theravada monks of southeast Asia still wear spice-color robes today, in shades of curry, cumin, and paprika as well as blazing saffron orange. You may be relieved to know that Buddhist monks and nuns no longer scavenge for cloth in rubbish heaps and cremation grounds. Instead, they wear robes made from cloth that is donated or purchased. The uttarasanga is the most prominent robe. It is sometimes also called the kashaya robe. It is a large rectangle, about 6 by 9 feet. It can be wrapped to cover both shoulders, but most often it is wrapped to cover the left shoulder but leave the right shoulder and arm bare. The antaravasaka is worn under the uttarasanga. It is wrapped around the waist like a sarong, covering the body from waist to knees. The sanghati is an extra robe that can be wrapped around the upper body for warmth. When not in use, it is sometimes folded and draped over a shoulder. The original nuns' robe consisted of the same three parts as the monks' robe, with two additional pieces, making it a "five-fold" robe. Nuns wear a bodice (samkacchika) under the utterasanga, and they carry a bathing cloth (udakasatika). Today, Theravada women's robes are usually in muted colors, such as white or pink, instead of bright spice colors. However, fully ordained Theravada nuns are rare. According to the Vinaya-pitaka, the Buddha asked his chief attendant Ananda to design a rice paddy pattern for the robes. Ananda sewed strips of cloth representing rice paddies into a pattern separated by narrower strips to represent paths between the paddies. In the Zen tradition, the pattern is said to represent a "formless field of benefaction." The pattern might also be thought of as a mandala representing the world. Buddhism spread into China, beginning about the 1st century CE, and soon found itself at odds with Chinese culture. In India, exposing one shoulder was a sign of respect. But this was not so in China. In Chinese culture, it was respectful to cover the entire body, including the arms and shoulders. Further, China tends to be colder than India, and the traditional triple robe did not provide enough warmth. With some sectarian controversy, Chinese monks began to wear a long robe with sleeves that fastened in the front, similar to robes worn by Taoist scholars. Then the kashaya (uttarasanga) was wrapped over the sleeved robe. Colors of robes became more muted, although bright yellow -- an auspicious color in Chinese culture -- is common. Further, in China monks became less dependent on begging and instead lived in monastic communities that were as self-sufficient as possible. Because Chinese monks spent part of every day doing household and garden chores, wearing the kashaya all the time was not practical. Instead, Chinese monks wore the kashaya only for meditation and ceremonial observances. Eventually, it became common for Chinese monks to wear a split skirt -- something like culottes -- or pants for everyday non-ceremonial wear. The Chinese practice continues today in China, Japan, and Korea. The sleeved robes come in a variety of styles. There is also a wide range of sashes, capes, obis, stoles, and other accouterments worn with robes in these Mahayana countries. On ceremonial occasions, monks, priests, and sometimes nuns of many schools often wear a sleeved "inner" robe, usually gray or white; a sleeved outer robe, fastened in the front or wrapped like a kimono, and a kashaya wrapped over the outer sleeved robe. In Japan and Korea, the outer sleeved robe is often black, brown, or gray, and the kashaya is black, brown, or gold but there are many exceptions to that. The dhonka, a wrap shirt with cap sleeves. The dhonka is maroon or maroon and yellow with blue piping. The shemdap is a maroon skirt made with patched cloth and a varying number of pleats. The chogyu is something like a sanghati, a wrap made in patches and worn on the upper body, although sometimes it is draped over one shoulder like a kashaya robe. The chogyu is yellow and worn for certain ceremonies and teachings. The zhen is similar to the chogyu, but maroon, and is for ordinary day-to-day wear. The namjar is larger than the chogyu, with more patches, and it is yellow and often made of silk. It is for formal ceremonial occasions and worn kashaya-style, leaving the right arm bare.